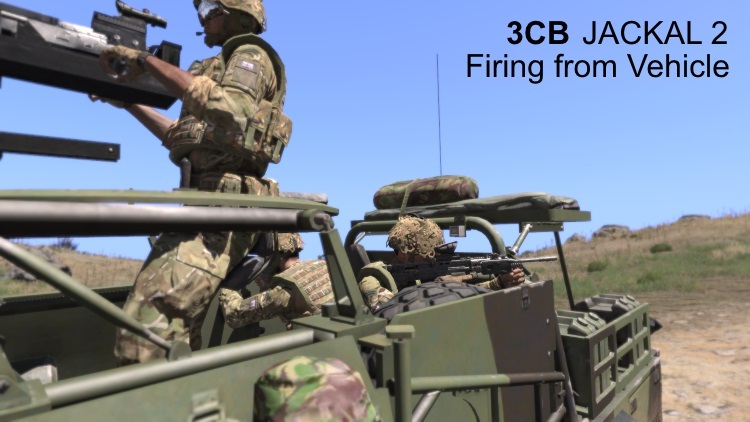 3 Commando Brigade | View topic - 3CB Vehicles - JACKAL 2 released! 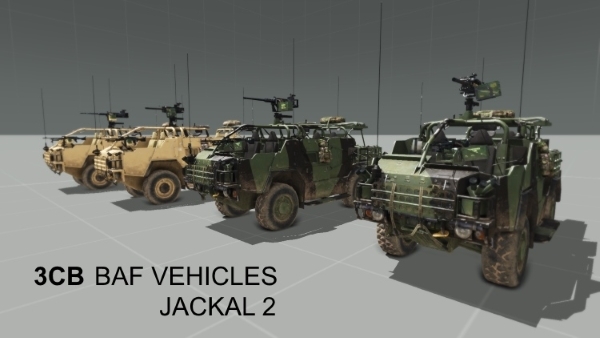 3CB Vehicles - JACKAL 2 released! 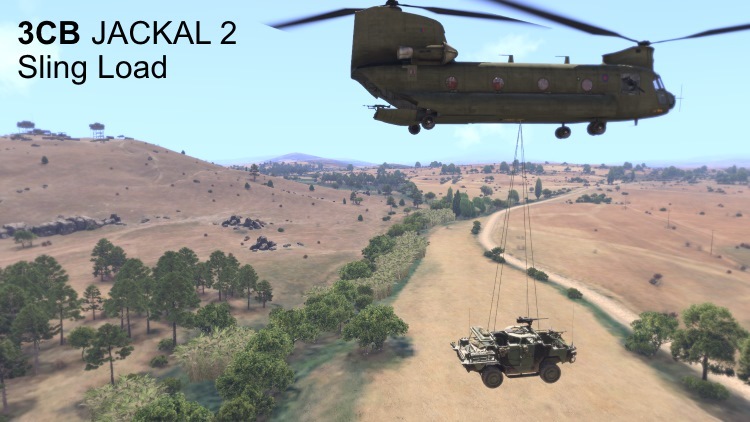 Just released from your 3CB mod team is an update to our @3CB_BAF_Vehicles mod, adding the much-anticipated Jackal 2. Please congratulate the mod team consisting of Andy, Evrik, Lifetap and Goodson for the excellent work they have done to bring this to fruition. Jackal 2 is a high mobility weapons platform, with a unique air-bag suspension system allowing rapid movement across varying terrain. It is designed to protect personnel against roadside explosions and mine attacks (the chassis is heavier than its predecessor to give additional protection). Jackal 2 is armed with a General Purpose Machine Gun for crew protection and can carry either a Heavy Machine Gun or a Grenade Machine Gun as the main weapons system in the fire support role. The gun ring has been moved forward to give a 360 degree sweep of fire, as opposed to the previous rear-fire only position on the original Jackal. 4 variants comprising 2 in desert camo, 2 in woodland, armed with L2A1 HMG or GMG. Driver, Commander, Gunner + 2 passenger seats both with FFV. Sling loadable by Chinook or Huron. Slight clipping of player body through Jackal sides while in Firing-From-Vehicle mode. Huzzah! Christmas is early this year. The elves have been busy! Looks brilliant, very impressive work from all those involved. On behalf of 3CB, the time and effort put into these mods is hugely appreciated! I do hope everyone enjoys this mod, I learnt alot by helping the others update it and am so ready to use it in anger. OMFG OMFG OMFG YES YES YES YES. well it technically is an MRAP that acronym stands for Mine resistant ambush protected. It's not actually a type of vehicle. edit sorry British military it is called the Ridgeback. gotta be said, loving the lynx models atm. the animation to enter and exit is a fantastic touch good work! !